Cosmos offers the most affordable way to travel around the world. When you choose a budget vacation with Cosmos, you will get the best value holiday package which works out to lesser than what you would pay for a day on your own with included sightseeing, travel, stay at quality hotels and services of the best tour directors and local guides. Vacation options start from lesser than $1000 per person. Add to that the wonderful deals and discounts that will help you find an affordable group tour that fits just right in your budget. 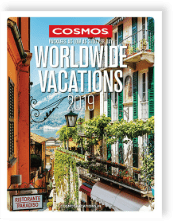 *Book a 2019 select Cosmos vacation to save US$100 off (except on COSMOSLite) for the land-only portion of the core tour not including extra night accommodations, hotel upgrades, extensions, taxes, fees, tips or supplements. Booking must be made and paid up between Apr 1, 2019 to May 15, 2019 for travel in 2019. Offer is combinable ONLY with Repeat Traveller Benefit & Group Credit. Not applicable to customs group and on TBA space. Applies to new 2019 bookings only, and offer will not be applied to pre-existing bookings. Offer reliant on space availability. Full cancellation penalties will apply. Consider Cosmos® to be your ‘unpackaged’ package tour. Unlike ‘regular’ coach tours, Cosmos designs experiences for Travelers with a capital T: People who love their freedom when travelling & want to get out there to do what locals do! Opportunity to sample local cuisine. Complete packages including 3 to 4 star hotels, transportation, sightseeing & even some meals from just US $100 per day. Travel companions from all over the world. Must-sees included & ample free time with someone local to help you do your own thing. Hassle-free touring with all logistics, including porterage, taken care of. Dynamic blend of transportation with first-class coaches, trains & cruises. Balanced itineraries with free time to explore on your own. 90 Years of delivering vacations of International standards with 97% satisfaction rating. Largest choice of vacations with year round departure dates. *10% off Young Travelers' discount based on the land-only portion of core tour, not including extra night accommodations and extensions. To receive the Young Traveler discount, the age of the traveler must qualify at commencement of services. Discount based on twin occupancy. Young Traveler discounts are not combinable with any other offer or discount other than the repeat traveler discount. *A back to back vacation must be booked within the same calendar year to be eligible for the discount. The back-to-back vacation should only have 15 days or less than 15 days between the vacations. Booking must be made, under deposit, and discount applied before December 31, 2019. Offer can be combined with repeat traveller benefit. Additional terms and conditions may apply. Additional restrictions may apply. Travel doesn’t have to be a couple or group activity! In fact, more than a third of our passengers are out there seeing the world on their own, so we’ve designed a great way for solo travelers to avoid paying the single room supplement and save money. We accept “guaranteed share” reservations that match up solo travelers of the same gender in twin-bedded rooms. And if no other traveler books “guaranteed share” on your chosen vacation, we’ll set you up in a single room at no extra charge! If you are a solo traveler who prefers the privacy of your own room, single accommodations can be reserved. Single room supplements are listed on the itinerary pages. NOTE: “Guaranteed share” basis is unavailable on certain vacations. “Guaranteed shares” are not available for any extra nights before or after your vacation, or on overnight trains or cruises and on certain vacations. For exceptions, please refer to Dates & Prices on the itinerary pages. You can also save when three people travel together and share accommodations. Refer to the itinerary pages for the specific reduction per tour. Triple room reduction applies to most Cosmos® Tours and Monograms packages. Check tour/package dates and prices for details. Not combinable with any other offer or discount other than repeat traveller benefit.